I love history – and especially the medieval period, so lists like this are a real pleasure to put together. This is a selection of facts that I hope most people will be unfamiliar with. If you think there are any interesting facts that have been left out, let us know in the comments. 1. 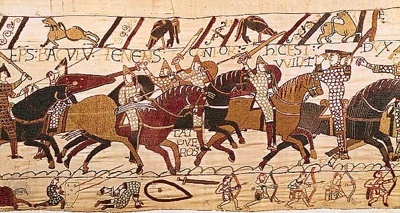 The famous Battle of Hastings did not take place in Hastings! It was actually waged at Senlac Hill – which is about 6 miles (10km) north-west of Hastings. 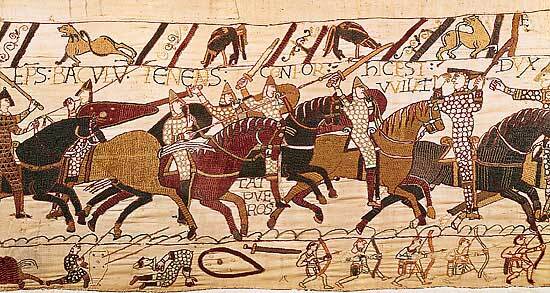 “The battle at Senlac Hill” certainly doesn’t have the same ring to it as “The Battle of Hastings”! 2. One of the earliest versions of the London Bridge was destroyed in 1014 when the Saxons rowed up the Thames, tied ropes to it, and pulled it down! This helped regain London for the Anglo-Saxon king against the Danes. It is possible that this event may have been the inspiration for the nursery rhyme “London Bridge is falling down”. 3. Berengaria of Navarre was the Queen of England by her marriage to King Richard The Lionheart. Little is known of her life – but what is known is that she is the only Queen of England never to step foot in England! The entire time that she was married to Richard, she lived in Europe. In fact, Richard himself only spent about 6 months in England as he was so busy traveling on crusader business. 4. In 1086, 10% of the population recorded in the Domesday Book (a large census) were slaves. In some areas, there were as many as 20%. 5. England used to be the native home of Brown Bears, but they became extinct around the 11th century. In latter parts of the Middle Ages, the bears were imported into England for sport. 6. There is much evidence to suggest that King Richard I (the Lionheart) was a homosexual. There is a possibility that he met his wife Berenegaria whilst in a sexual relationship with her brother, the future King Sancho VII of Navarre. It is also reported that he and King Philip II of France were involved. A historian of the time, Roger of Hoveden said they “ate from the same dish and at night slept in one bed” and had a “passionate love between them”. 7. It was not uncommon in England during the medieval period, for animals to be put on trial for crimes. Animals could be sentenced to death if found guilty of their crimes. Take that PETA! 8. The Middle English term “pygg” referred to a type of clay. 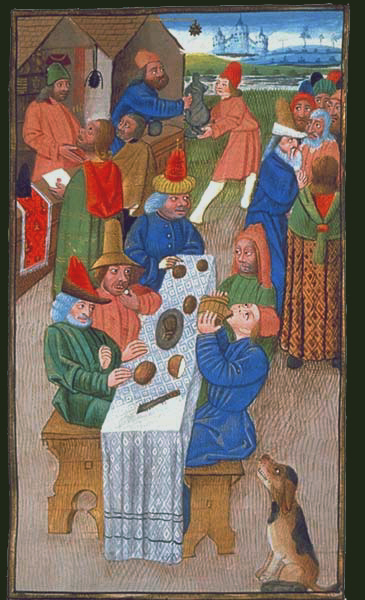 In the middle ages, people would often keep coins in jars or pots made of pygg – these were called “pygg jars”. By the 18th century, with the evolution of language, these came to be known as a “pig bank” or “piggy bank”. 9. Contrary to popular belief, medieval English people bathed quite regularly in public baths designed for that purpose. This was due to the belief that “cleanliness is next to Godliness”. Public baths were eventually opposed by the Protestants in the 16th century because of prostitution being common there. 10. Most common folk had to produce their own food. For this reason rye and barley bread was common amongst the poor who could not afford the large quantities of manure needed to grow wheat for white bread. 11. Trial by ordeal was common in England in the middle ages. In this trial, the accused would be subjected to a very painful task (such as being burnt by a hot iron) – if they survived the trial, or their wounds healed quickly, they would be found not guilty as it was believed that God had performed a miracle to help the accused. The Catholic Church forbade participation in these trials and demanded the use of compurgation instead. Compurgation was the taking of an oath of innocence by the accused which 12 peers must believe. 12. One bizarre recipe for a medicine to protect against the plague involved drinking ale that has had crushed roasted egg shells, leaves and petals of marigold flowers, and treacle added to it. Needless to say this was not particularly effective. 13. The Barber’s pole symbolizes blood and bandages, as most barbers also performed the roles of surgeons and dentists in their towns. Bandages stained with blood would be washed and hung from a pole outside the barber’s shop – these would then twist in the wind to form the spiral pattern we are all familiar with today. Macabre but true. 14. Prior to the introduction of surnames in England in 1066, everyone born had just one name. When surnames were introduced they would often include a nickname – such as Robert Red (symbolic of his hair color). If Robert went bald over time, his name could change to “Robert Ball” (ball meaning bald in Middle English). In time, the system evolved to a point where people would take the same name as their father – giving us the modern surname system. 15. Contrary to popular belief, gargoyles were not added to Churches and buildings to ward off evil spirits – they were drain pipes! True gargoyles project out of a wall (decorative monsters are not gargoyles) and rain water flows out their mouths away from the building, rather than down the side of the building causing damage. Their true purpose can be seen quite clearly in the photograph above of St Mary’s Church in Adderbury. 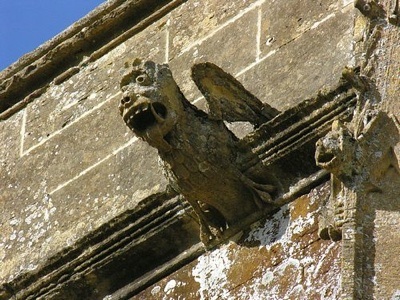 Gargoyles can be found all over Great Britain and are visible on virtually every Church built there during the middle ages.